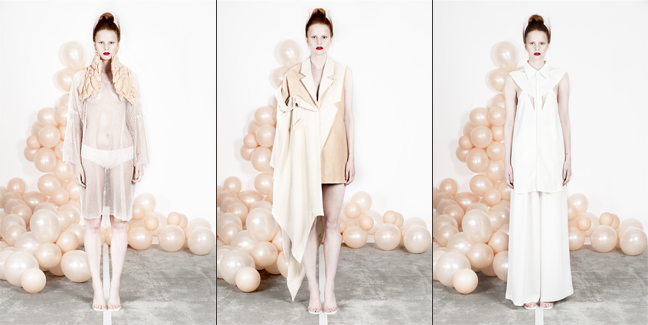 MINNAPALMQVIST was set up in 2009 by Finnish born designer and artist Minna Palmqvist, and has since been nominated for the Mercedes Benz Young Fashion Industry Awards in Stockholm (2011), won the Who’s Next Young Designer Contest (2012) and been in the finals of the T-Force Fashion Awards in Guangzhou, China (2012). The concept of MINNAPALMQVIST, called Intimately Social, has its start point in the somewhat complicated clashes between the socially accepted body and the real fleshy bodies we inhabit. It is a conflict between what we wish for and what we are trying to hide. Where the garments emerge from intimate details and unwanted body shapes making their way into the world of fashion with no pardon. At the end of September 2012, MINNAPALMQVIST will open up her own webshop, with a range of her RTW collection alongside the ATELIER line where orders can be made from the studio in Stockholm. Intimately Social 9.12 stresses the ambiguous feelings a woman can have towards her body as well as the pressure she can feel to fit into the expected norms body wise as well as socially. This collection walks a thin line between strength and decay; lightness and weight, façade and reality, al the while showcasing femininity that balances on the edge of a nervous breakdown. The signature materials of the brand, also present in the SS13 collection are soft and draped, and topped by naturally tanned Swedish reindeer leather quilted and shaped into a body like feel. The colour scale is soft and light and referring to the designer’s own skin tone, with apricot leather tones, beige and white.